Sue studied Physiotherapy in London and in 1987 she gained a 2:1 BSc(Hons) degree with a Distinction in Clinical Practice at the Royal London Hospital. Since then she has worked in the NHS in London and Birmingham, before working in industry at Sainsbury plc, Rank Xerox and The Welcome Foundation. During this time she gained a qualification with The American College of Sports Medicine and a Diploma in Occupational Health. She continues to attend regular Continual Professional Development to maintain up to date knowledge and skills. 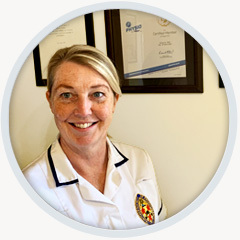 In 1991 she started full time in Private Practice in Guildford and now provides a Private Physiotherapy Service in Godalming and at GP surgeries, in Shere and Merrow Park, Guildford. With over 25 years of working experience Sue has broad experience of assessing and rehabilitating many musculo-skeletal (MSK) problems. More recently she has developed an interest in MSK chronic pain management and in particular back pain. Throughout her career she has rehabilitated many patients with sporting injuries across all age groups. She has a special empathy with this group of people due to personal experience of a ruptured Achilles tendon and a reconstructed Anterior Cruciate ligament. Her sporting interests have included representative club level squash, tennis, table tennis, swimming and county badminton which means she has hands-on sporting knowledge. More recently she has started playing Racketlon - with some recent success! Her background in Occupational Health, skills in acupuncture and long working career in MSK conditions securely enables her to accurately assess and treat the spinal problems, sports injuries and chronic pain issues so prevalent in today's society. Throughout her career she has also had a fulfilling family life and has two ‘grown up’ children and so understands how busy and frustrating life can be. Sue works in close conjunction with many local GPs and Consultants to ensure full medical back up if required.